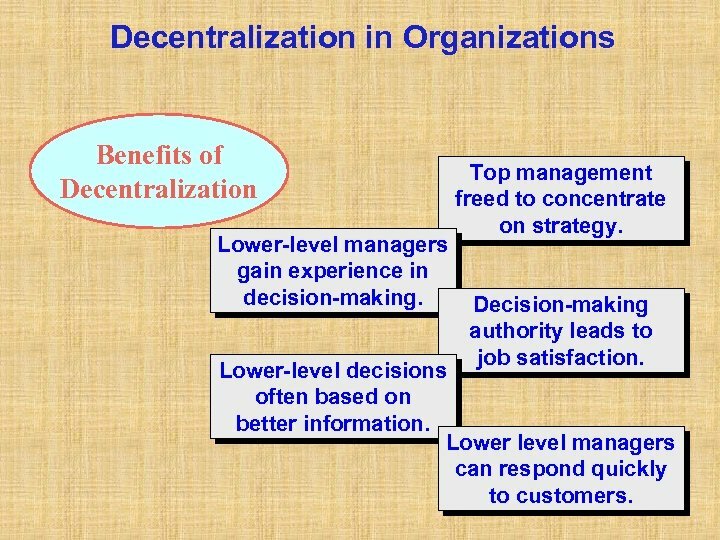 Decentralization in Organizations Benefits of Decentralization Lower-level managers gain experience in decision-making. Top management freed to concentrate on strategy. Decision-making authority leads to job satisfaction. Lower-level decisions often based on better information. Lower level managers can respond quickly to customers. 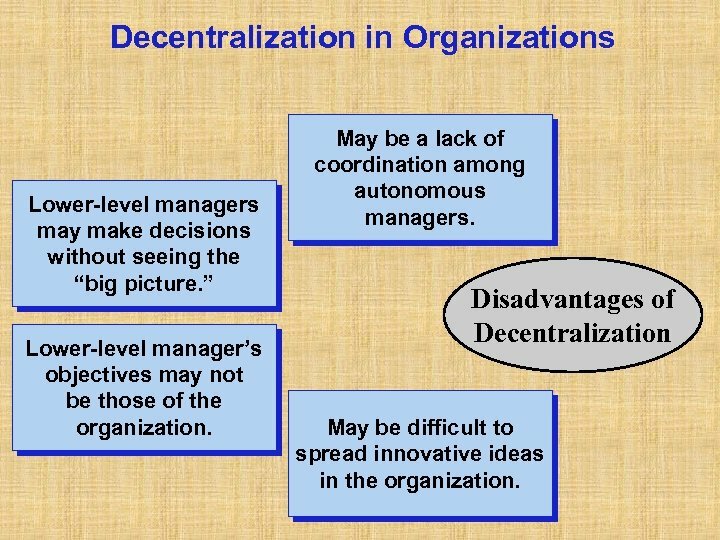 Decentralization in Organizations Lower-level managers may make decisions without seeing the “big picture. ” Lower-level manager’s objectives may not be those of the organization. May be a lack of coordination among autonomous managers. 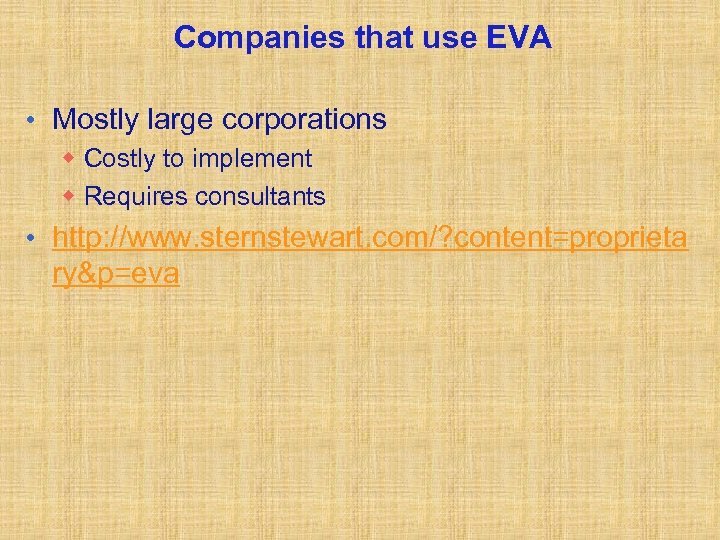 Disadvantages of Decentralization May be difficult to spread innovative ideas in the organization. 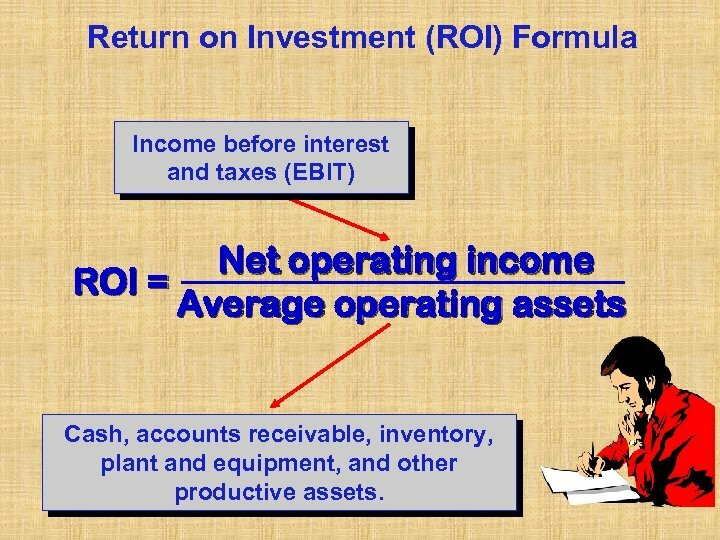 Return on Investment (ROI) Formula Income before interest and taxes (EBIT) Net operating income ROI = Average operating assets Cash, accounts receivable, inventory, plant and equipment, and other productive assets. 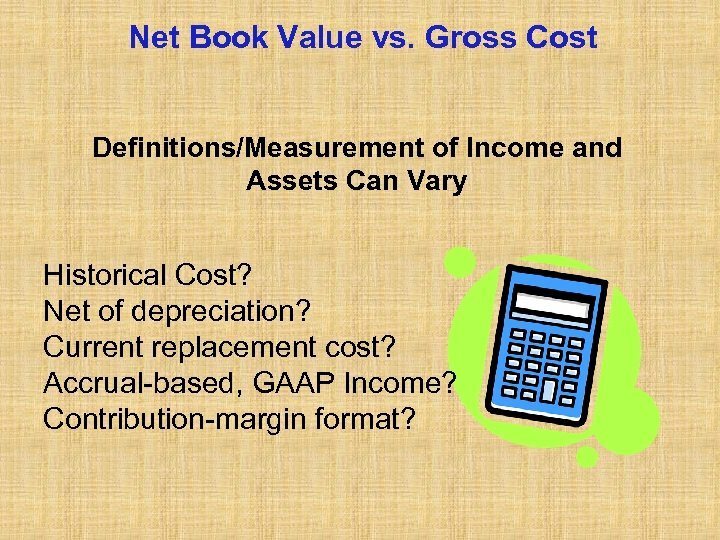 Net Book Value vs. 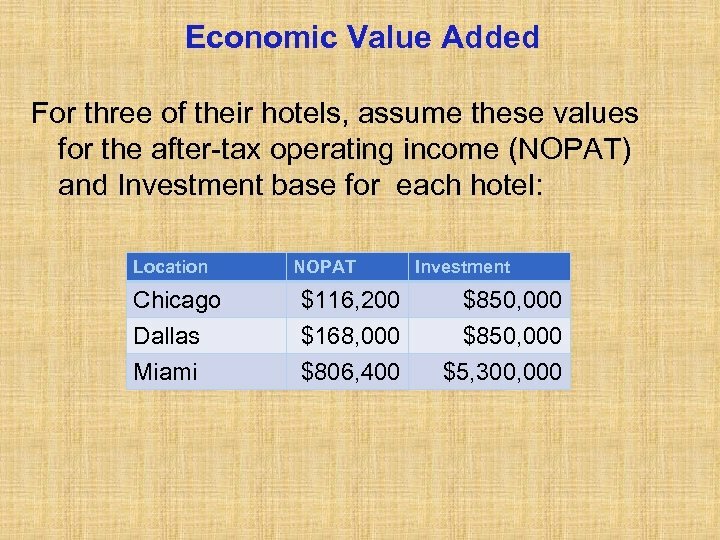 Gross Cost Definitions/Measurement of Income and Assets Can Vary Historical Cost? Net of depreciation? Current replacement cost? 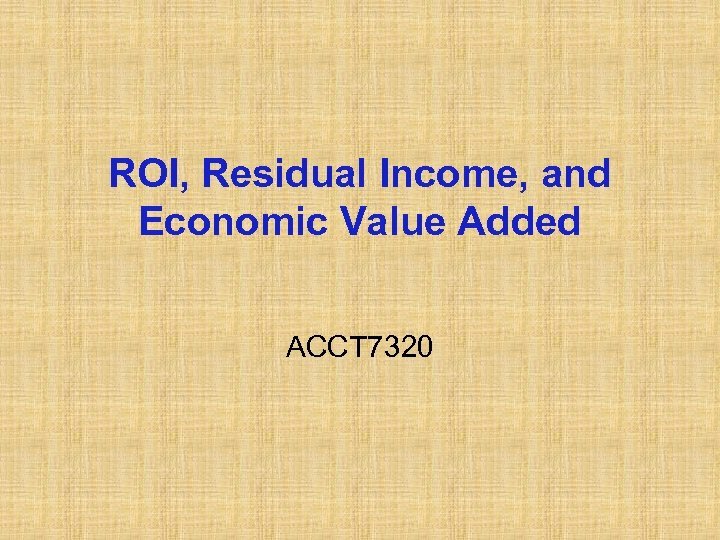 Accrual-based, GAAP Income? Contribution-margin format? 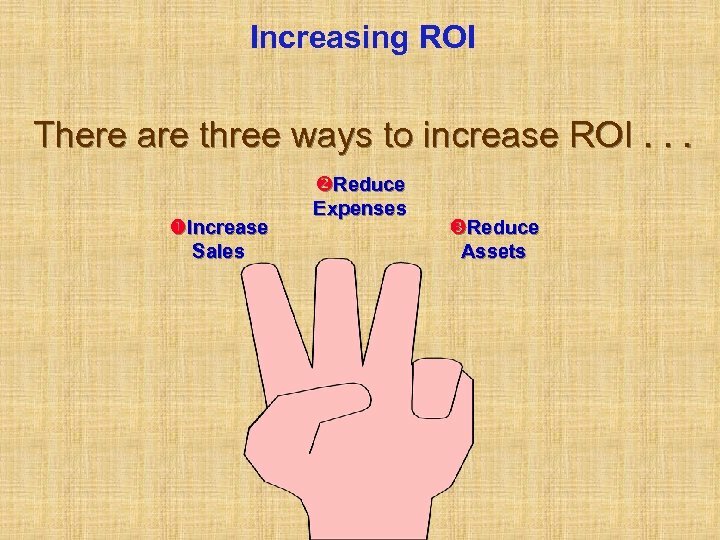 ROI and the Balanced Scorecard It may not be obvious to managers how to increase sales, decrease costs, and decrease investments in a way that is consistent with the company’s strategy. 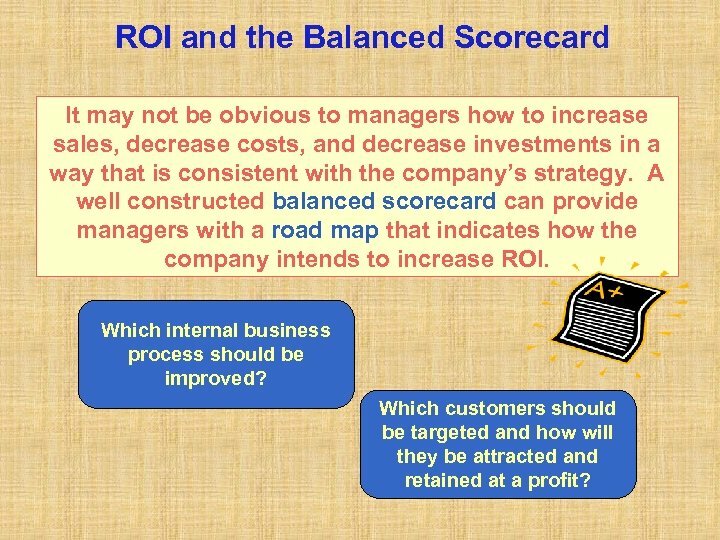 A well constructed balanced scorecard can provide managers with a road map that indicates how the company intends to increase ROI. Which internal business process should be improved? Which customers should be targeted and how will they be attracted and retained at a profit? 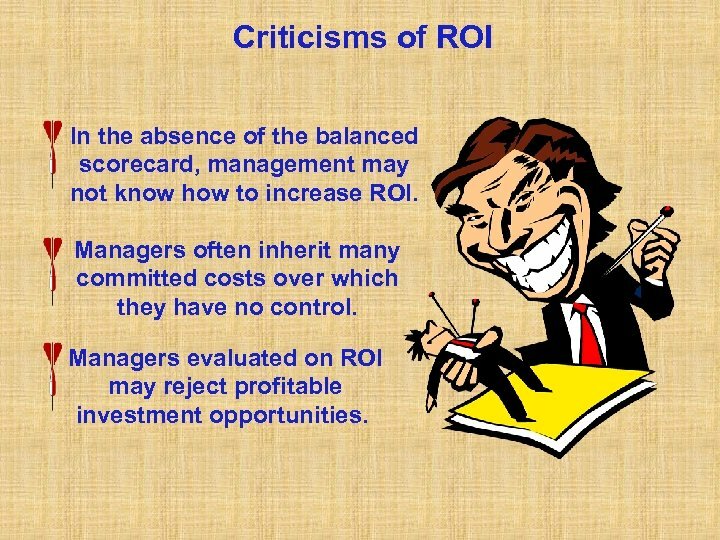 Criticisms of ROI In the absence of the balanced scorecard, management may not know how to increase ROI. Managers often inherit many committed costs over which they have no control. 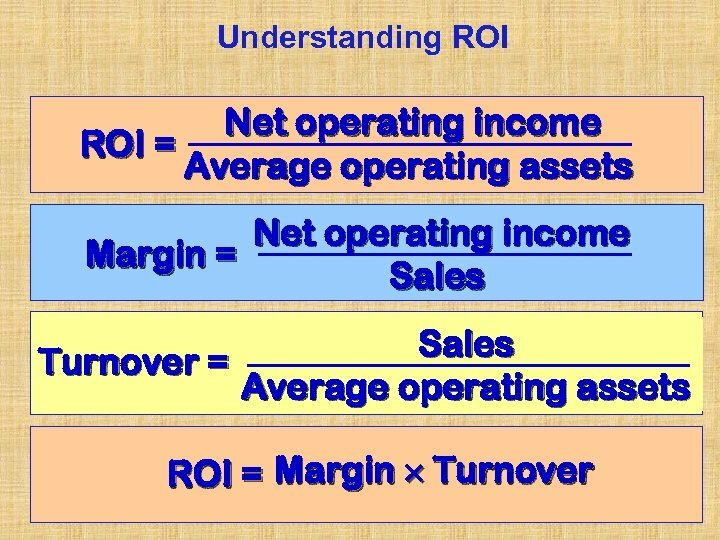 Managers evaluated on ROI may reject profitable investment opportunities. 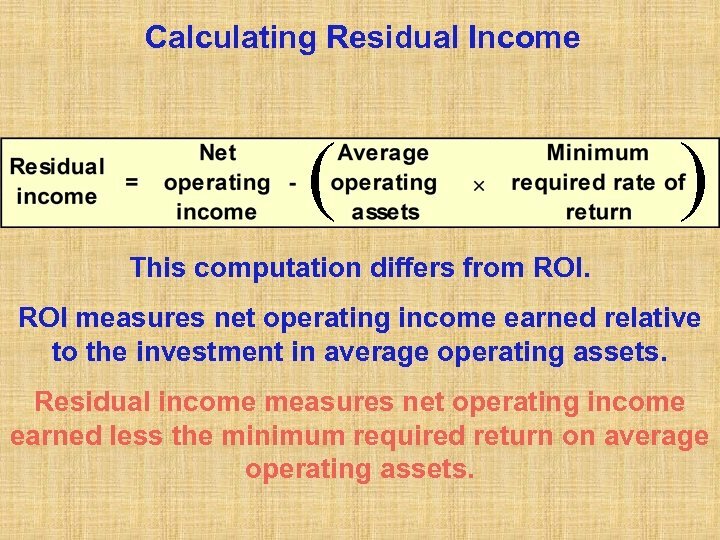 Calculating Residual Income ( ) This computation differs from ROI measures net operating income earned relative to the investment in average operating assets. 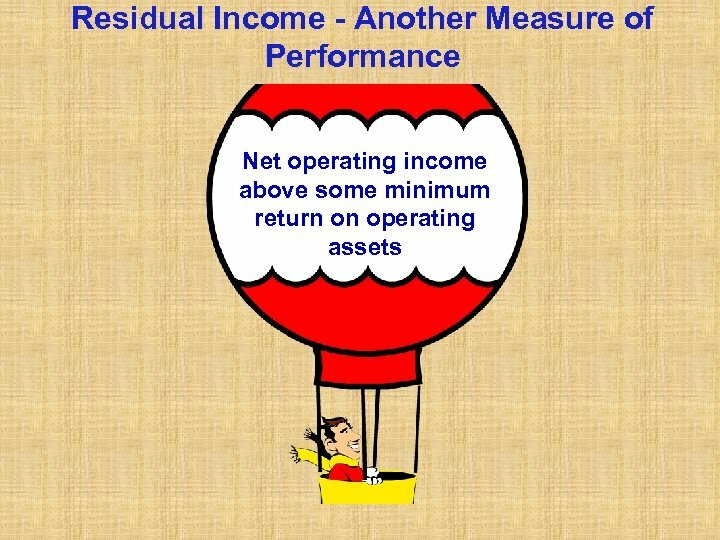 Residual income measures net operating income earned less the minimum required return on average operating assets. 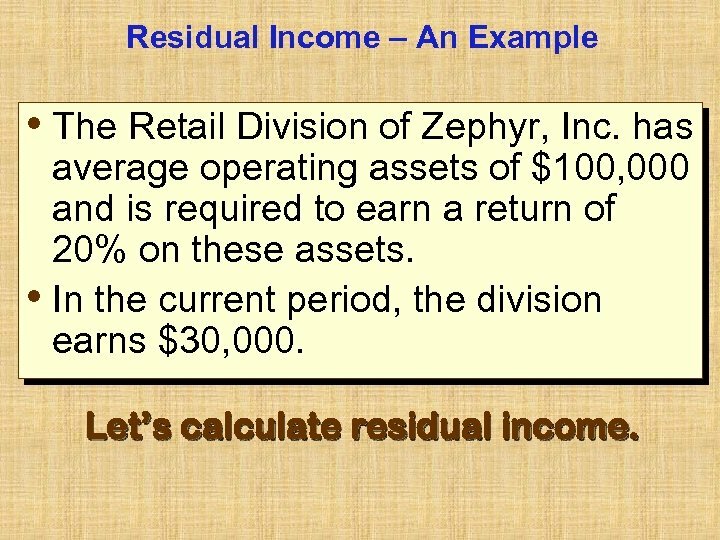 Residual Income – An Example • The Retail Division of Zephyr, Inc. has average operating assets of $100, 000 and is required to earn a return of 20% on these assets. • In the current period, the division earns $30, 000. 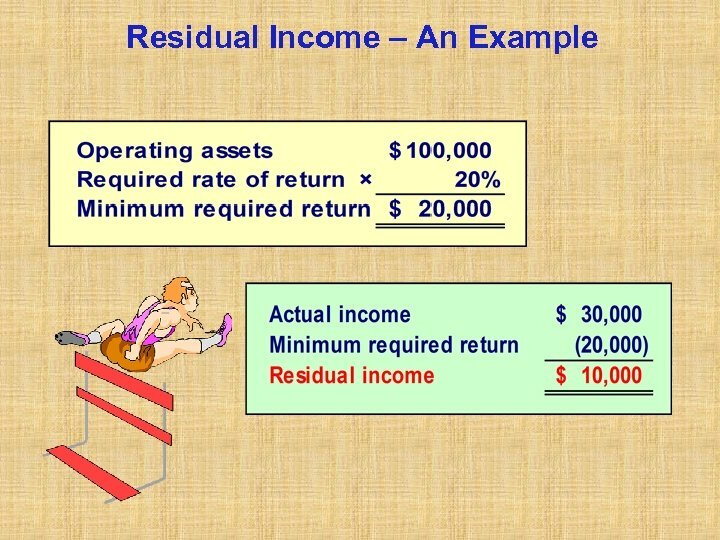 Let’s calculate residual income. 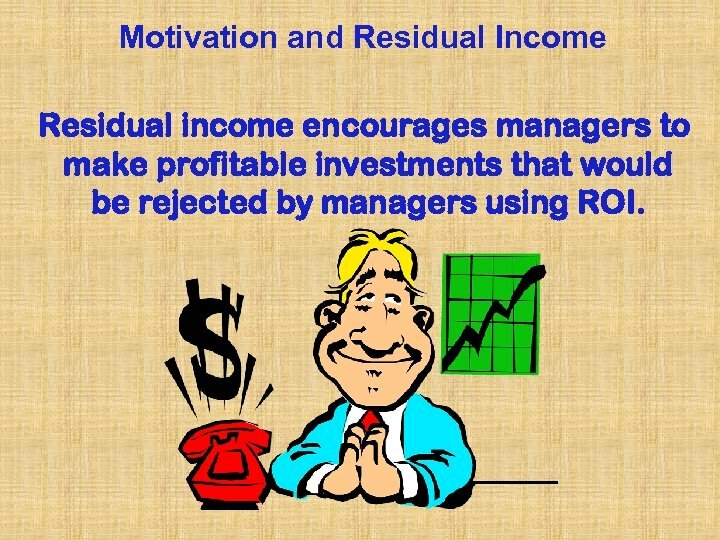 Motivation and Residual Income Residual income encourages managers to make profitable investments that would be rejected by managers using ROI. 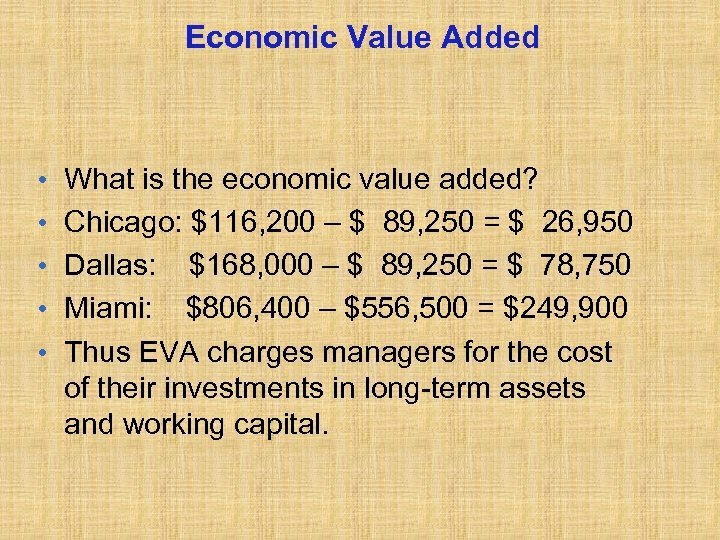 Economic Value Added • Why Long-term assets + Working capital? 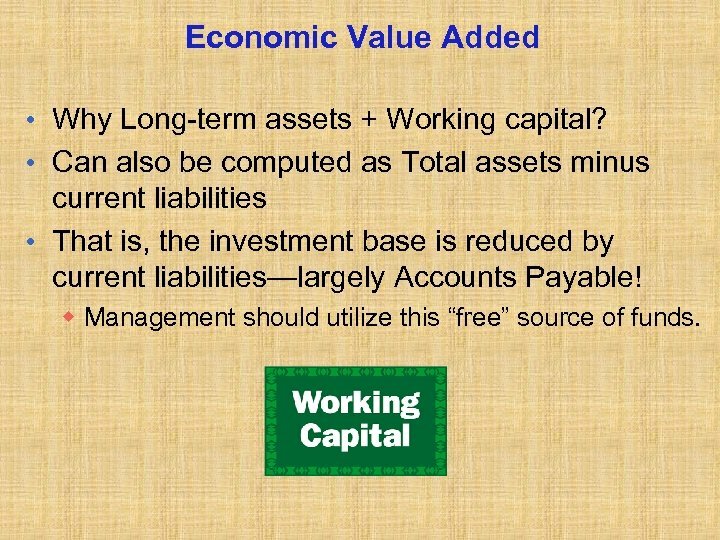 • Can also be computed as Total assets minus current liabilities • That is, the investment base is reduced by current liabilities—largely Accounts Payable! w Management should utilize this “free” source of funds. 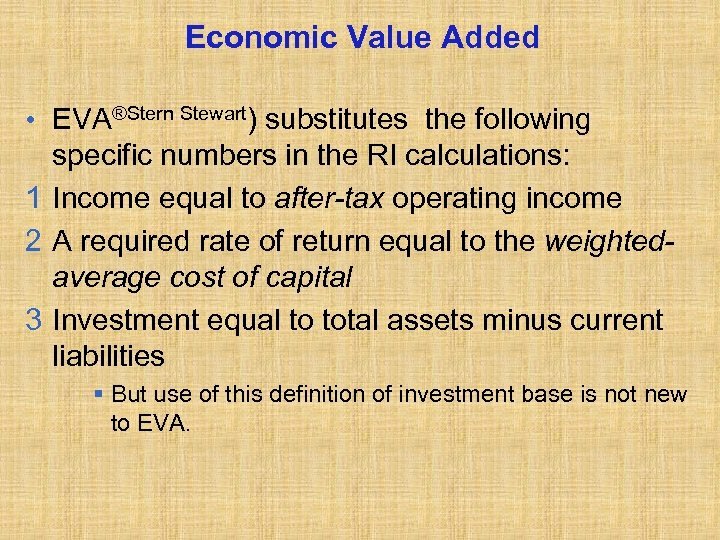 Economic Value Added • EVA®Stern Stewart) substitutes the following specific numbers in the RI calculations: 1 Income equal to after-tax operating income 2 A required rate of return equal to the weightedaverage cost of capital 3 Investment equal to total assets minus current liabilities § But use of this definition of investment base is not new to EVA. 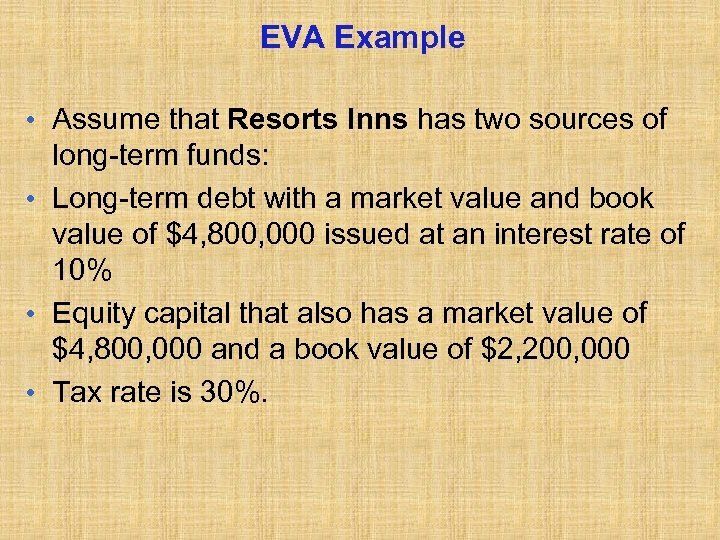 EVA Example • Assume that Resorts Inns has two sources of long-term funds: • Long-term debt with a market value and book value of $4, 800, 000 issued at an interest rate of 10% • Equity capital that also has a market value of $4, 800, 000 and a book value of $2, 200, 000 • Tax rate is 30%. 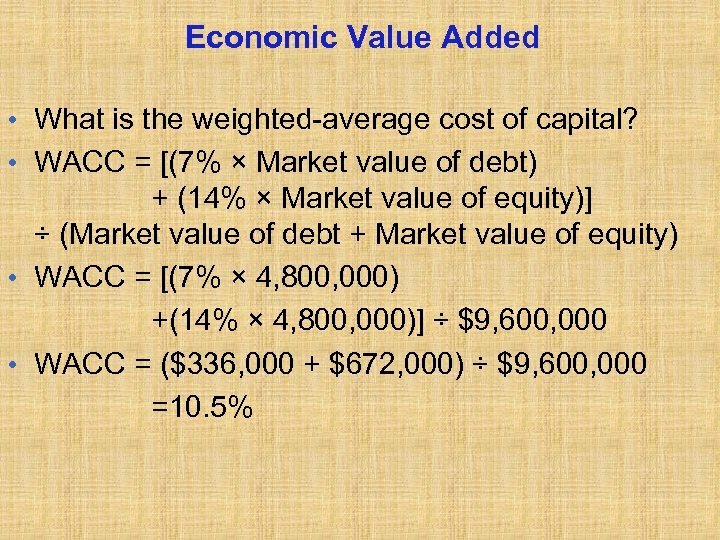 Economic Value Added • What is the after-tax cost of capital? 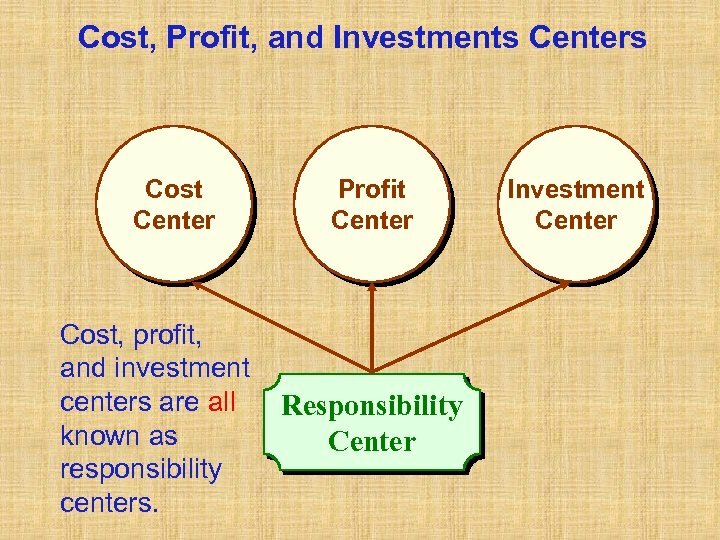 • For debt, 10% × (1 – 30%Tax rate) = 7% • The cost of equity capital is the opportunity cost to investors of not investing their capital in another investment that is similar in risk to Resorts Inns. 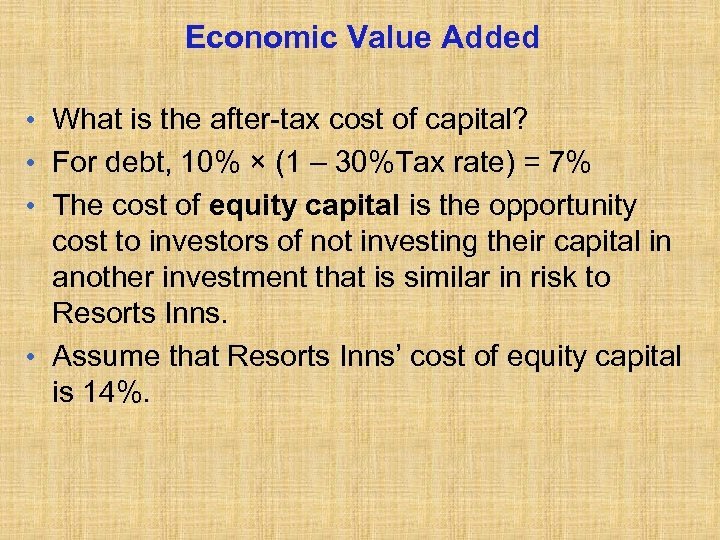 • Assume that Resorts Inns’ cost of equity capital is 14%. 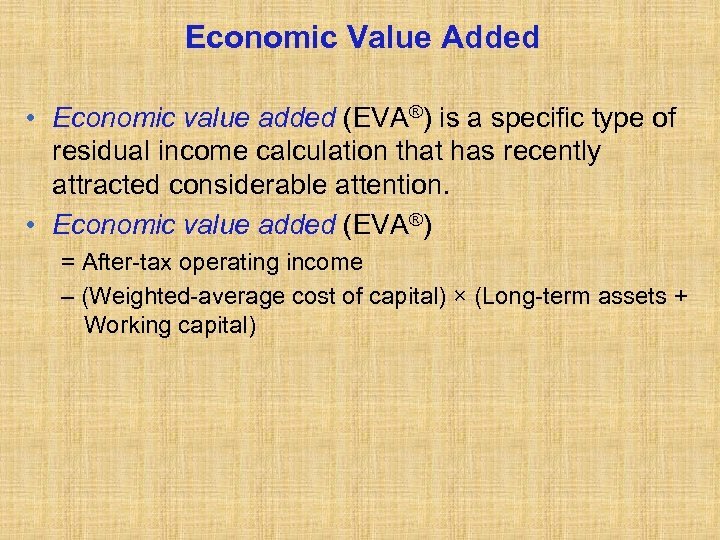 Economic Value Added • • • What is the economic value added? Chicago: $116, 200 – $ 89, 250 = $ 26, 950 Dallas: $168, 000 – $ 89, 250 = $ 78, 750 Miami: $806, 400 – $556, 500 = $249, 900 Thus EVA charges managers for the cost of their investments in long-term assets and working capital.